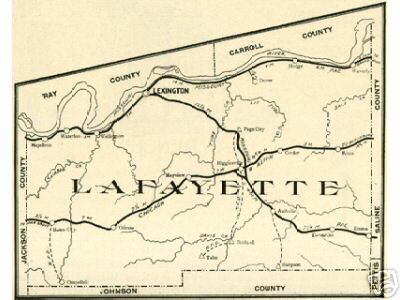 Over 1900 pages of Lafayette County, Missouri history and genealogy including more than 1300 family biographies plus 8 different maps of the Lafayette County, Missouri area plus 1920 Lafayette County, Missouri Plat Map Book. Includes the cities of Lexington, Higginsville, Concordia, Odessa, Waverly, Bates City, Corder, Dover, Mayview, plus more than 20 other towns. Also includes a large amount of Civil War History including The Battle of Lexington, Missouri or the Battle of Hemp Bales. This 28 page plat map book is in full color and at the original large format size. These maps show not only each of the cities and towns in Lafayette County in 1920 but also each of the rural townships. Those who owned farm acreage in rural area are shown by name which makes it possible to pinpoint the location of where an individual family actually lived in 1920. This plat map book is a rare and valuable resource for genealogy and historical research in Lafayette County, Missouri. Section Three of five, ALL on one CD: The complete 1881 History of Lafayette County, Missouri by the Missouri Historical Company. This detailed (520 pages in all) book has an incredible amount of historical and genealogical information about Lafayette County, Missouri from its earliest settlement up to 1881. This is an exact photo replica of all the pages pertaining to Lafayette County, Missouri including all of the historical and biographical information. Included are a total of 502 different family biographies. Section Four of five, ALL on one CD: The complete 1893 Portrait and Biographical Record of Lafayette and Saline Counties, Missouri by the Chapman Bros., Chicago. This large book of 550 pages book is exclusively devoted to biographies of individuals and families from Lafayette County, Missouri or the adjoining Saline County, MO. from its earliest settlement up to 1893. This is an exact photo replica of all the pages pertaining to both Lafayette County and Saline County, Missouri. This rare two volume set includes a total of 859 pages and has an incredible amount additional of historical and genealogical information about Lafayette County, Missouri from its earliest settlement up to 1910. This is an exact photo replica of the original two volume Lafayette County, Missouri History including all of the historical and biographical information. Included are a total of 323 different family biographies. The cost for this CD containing all five sections described above is only $9.95 plus shipping, or only $6.95 as a digital download! A large amount of history and genealogy information for very little cost! A truly fascinating view of Lafayette County, Missouri from its first settlement to 1910. Also includes considerable information concerning the Civil War period. Shipping is only $1.95 for First Class Mail in the United States and Canada. If outside of the United States or Canada, please contact us for shipping costs. We accept checks, money orders and all major credit cards via the shopping cart, mail, or by phone at 816-204-7593. Since we offer many different county history and genealogy CDs, please be sure to specify that you wish to order the Lafayette County, Missouri History, Genealogy and Maps CD. If ordering more than one CD, the shipping cost is $1.95 for the first CD plus only 25 cents shipping for each additional CD purchased.